I’ll admit it. When it comes to airplane travel, my first inclination is to be a loner. Though an outgoing person by nature, when I fly my tendency is to retract into my seat and enjoy a parenthesis of disconnectedness in an otherwise full and busy life. No cell phones. No text messages. No email or social media. This is a recipe for productivity and rest. A funny thing, though, has happened to me over the years. There is one circumstance that trumps all others. I find myself making a beeline to sit in the middle of one seemingly undesirable scenario. I don’t pity the overwhelmed mother on a flight with three kids. I pity the young professional who, due to selfishness, material pursuit, or 1,000 other reasons has declined to have children. I pity the person who finds kids too expensive, too burdensome, too disruptive to enjoy. The parent who feels a bit overwhelmed is to be supported, assisted, encouraged, and commended, but not pitied. Their station of life is life, and it is good. 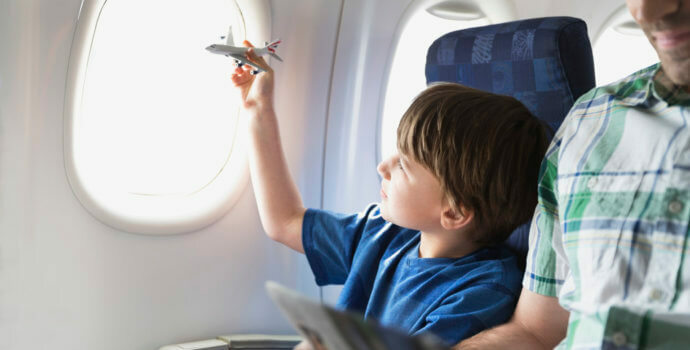 Second, most parents are on edge when they fly, afraid their crying baby or squirming toddler will be unwelcome to those seated nearby. My wife and I know these feelings because we have been victim to them ourselves. Perhaps that is why I especially enjoy watching the parent’s relief when I say I love children, am the father of five young children, and am honored to get to fly by their family. For most parents, these words come as good news from a distant land. It pleases me to get to share them. Third, parents of young children often have a particular openness to the gospel. Whether it is sentimentality, physical weariness, or a renewed sense of life-stewardship, a mother holding a babe or a father wrestling with a toddler are often open to a spiritual conversation. The Lord often seems to work in the hearts of parents during this stage of life, prompting receptivity to the gospel. Moreover, a warm response to disruptive children is so rare in contemporary society that a gesture of grace itself often segues to the message of Christ. Fourth, I love the constant reminder of the biblical pattern. God has ordained the family, and a young couple with children, after all, is a sign of God’s common grace. God intended the world to know children—and lots of them. Quiet homes and empty nurseries are a lamentable aberration to the divine pattern, and for me to see a family in action is a present reminder of God’s glory and grace. Fifth, flying by a young family gives me an opportunity to serve. Travel is an irregularity from a normal and healthy pattern of life. Waitresses serve you meals; skycaps scurry to help with your luggage; bellmen are at the ready to tend to your baggage; and flight attendants hustle at the press of a button. While nice, these luxuries can be heady, leading you to think you are at the center of your own universe. As a helpful counterbalance, lending a hand to a young parent can bring much needed help to them and much needed perspective to you. Sixth, it reminds me of my own kids. The wheels usually are not up on the plane before I find myself missing my own children. In some small way, I can vicariously enjoy my own children as I enjoy my neighbor’s. Furthermore, I often observe a need, notch a life-stage observation, or note a child’s particular want; all of which can help me be a better father, and, in the meantime, remind me of God’s goodness to me through the gift of my own children. Seventh, I love the adventure of it all. Toys flying, kids squirming, juice-cups dripping, even babies squalling, all bring sunshine to my heart. Life is an adventure, and life with kids—your own or others—is especially adventurous. I find myself laughing, smiling, and leaving the plane happier than when I boarded it. So, next time you fly, spurn conventional wisdom, take one for the team and choose to sit in the midst of a young mother with, as Loretta Lynn would say, “one of them a toddlin’, and one is a crawlin’ and one’s on the way.” You’ll likely be a blessing to that family, and, I promise you, they will be a blessing to you.